Our Emirates Visit started in Dubai in April of 2016. We arranged our stay ourselves. We used Viator and Memphis Tours to see the sights. The flight from Seattle to Dubai took 14 hours. We chose a free upgrade to spacious emergency exit seats. During the flight you could head to the back of the plane, where self serve candy bars, fruit and drinks were available. The free movies and free internet helped the time pass easily. I made FaceTime calls with friends back home as we passed over the North Pole. Emirates Airline spoiled me. It will be hard to go on a regular airline again. The culture shock I anticipated when we got to Dubai never occurred. Taxi drivers are fluent in English and the cabs are metered. Since our Emirates visit, video monitoring has been put in all cabs. Pink cabs can only be used if a female passenger is present. Our first night in Dubai was in a 900 sq ft One Bedroom Suite at the Ramada Downtown Dubai. It had a view of the Dubai Fountains and the Burj Khalifa tower. The living room and bedroom both had views. There was a luxury bathroom, a full kitchen and an island dining room. The suite was amazing. We checked our bags and walked around the fountains to the Dubai Mall. The music at the fountains was lovely and also surprising, because the song we heard was Delibes’ Flower Duet. The Dubai Mall wasn’t what I expected. The first store was Tim Horton’s, the Canadian coffee and donut shop. English is spoken everywhere in the mall. You can pay using American dollars anywhere and your change will be in US dollars. The experience was like going to Las Vegas, but the fountains and the mall are both on a much grander scale. The only difference was the local dress of some of the women. A typical family in the mall might involve a child in North American clothing with a pack pack, a dad in a sports T-shrit and jeans and a mother completely covered in a burka. 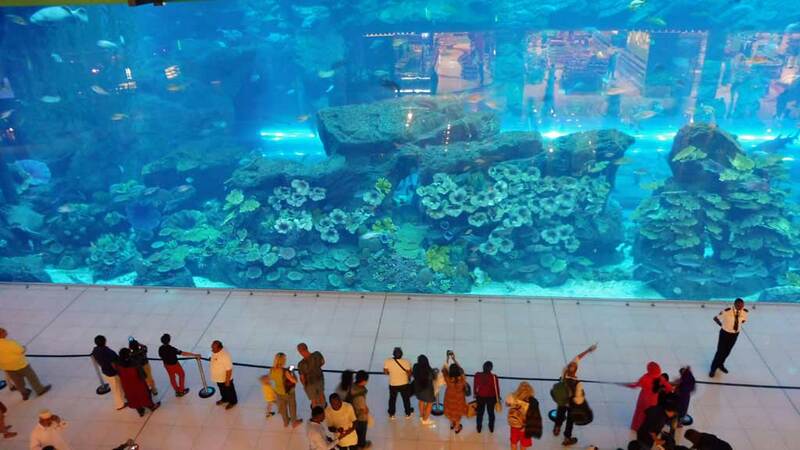 We returned to the Dubai Mall again that evening. After sunset the temperatures were very comfortable . The paths around the fountains were packed with people. 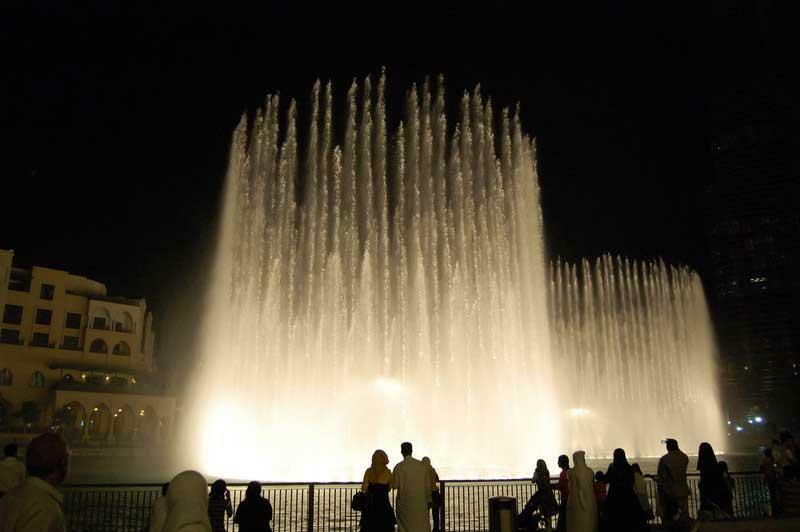 The fountain music now was mainly Arabic. We wandered through the mall to find major attractions, such as the world’s largest aquarium and the ice skating rink. 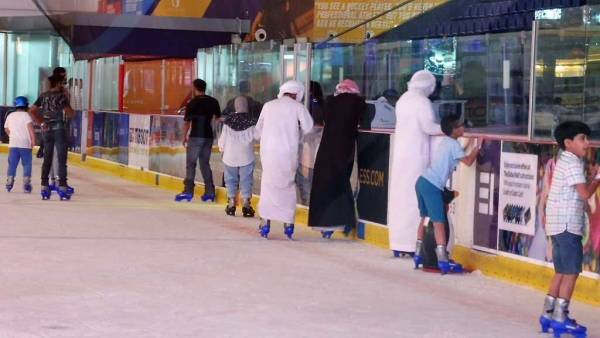 It was fun to watch locals trying to stay up on their skates. The next morning we walked to the Burj Khalifa from our hotel. 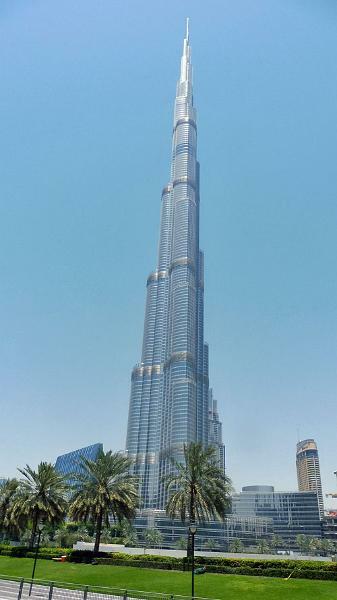 The entrance to the tower is in the Dubai Mall. Our online tickets took us to the 124th floor. 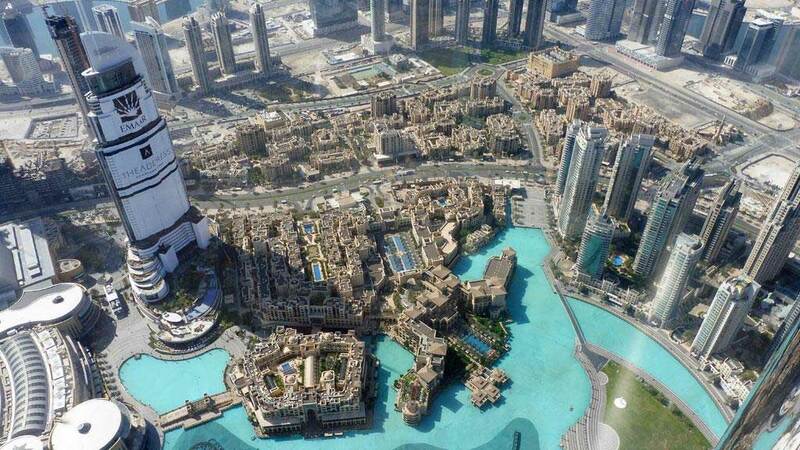 From there you can see the Jumeirah Palm Islands, the World islands and the heart of downtown Dubai. After the Khalifa, it was time to check out of the Ramada Downtown Dubai and head to our more affordable accommodation at the Holiday Inn Express Dubai Safa Park. 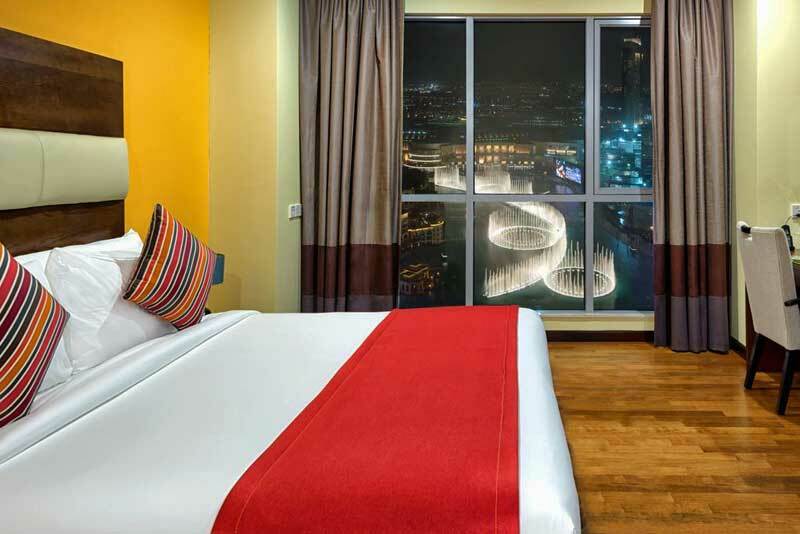 The Holiday Inn Express Dubai Safa Park is affordable accommodation with a great buffet. The hotel works great as a base for tours. With Viator we took 3 tours combined for one discounted price. The tours were spread over a number of days at our option. The Viator morning city tour took us through the market area to a stop at Dubai Creek. Then we proceeded to stops at Jumeirah Mosque, Jumeirah Beach and the Burj al Arab hotel. You can’t even enter the foyer of the Burj al Arab without a reservation, so we viewed it from the beach. Our last stop was for a photo op at the Atlantis Hotel on the Jumeirah Palm islands. The Viator Desert Adventure started in the late afternoon and took us 40 minutes outside the city limits. There were lots of 4x4s full of tourists on the dunes. Nearly every vehicle was white. The driver let air out of the tires, so the vehicle could operate on the dunes. Afterward we attended one of many camps in the desert, where a buffet meal was provided. Entertainment included belly dancers and whirling dervishes. 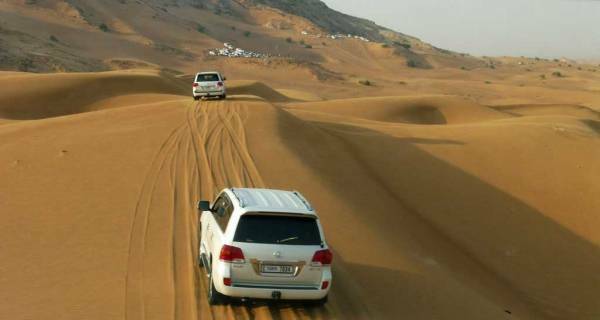 The desert adventure was pure tourism and didn’t really represent a Middle East cultural experience. The third tour with Viator was an Evening Dhow Cruise. After they dropped us at the Dubai Marina, we boarded the dhow. Dinner was served as we cruised the canals of the Dubai Marina. The views of the architecture and lighting of modern buildings was impressive. We also booked a Memphis Tours Day Trip to Abu Dhabi in a small van. Our guide was from Egypt. He said his family was still in Egypt. 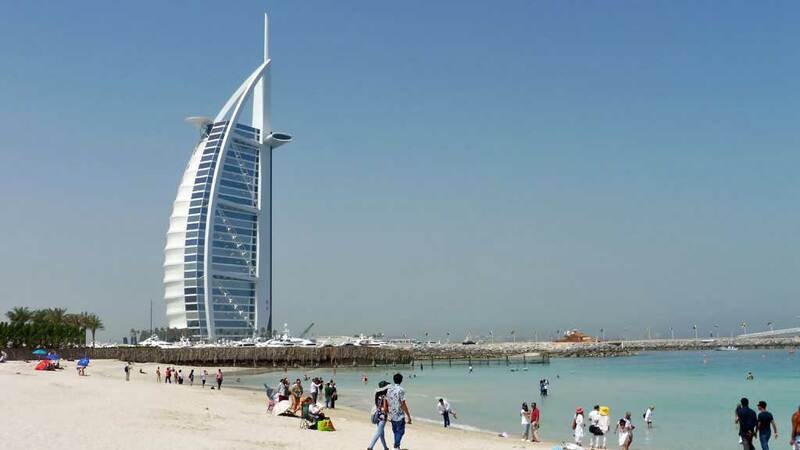 He came to Dubai to work, because tourism in the Middle East is down 90% since 2011. Our first stop was the entrance to Ferrari World. The second stop was the highlight of the tour. We visited the Sheikh Zayed Grand Mosque. It was gorgeous inside and out. 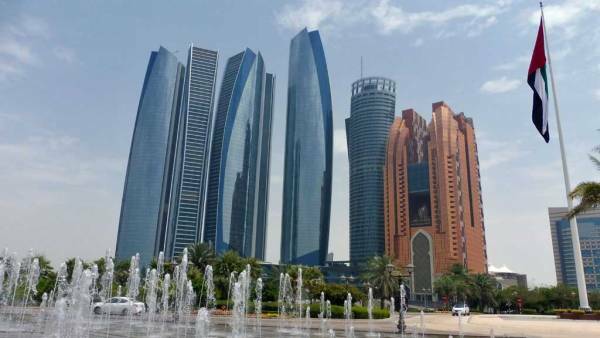 The mosque was built in 2007 from Emirates oil revenues. 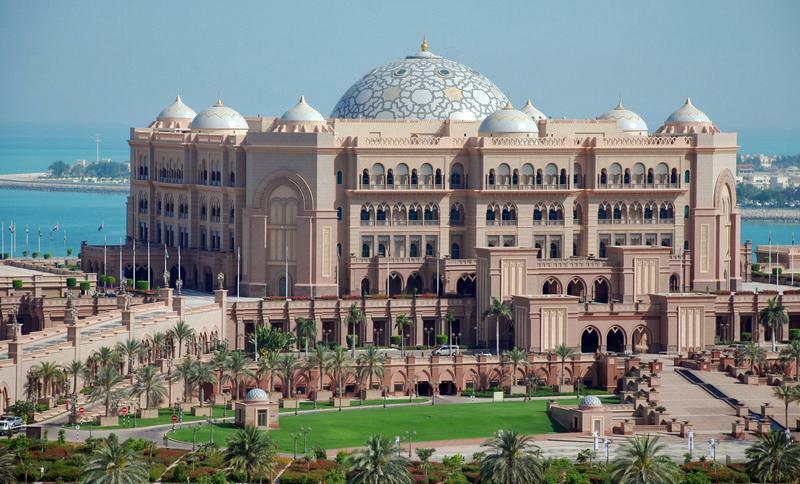 Next we stopped in front of Emirates Palace and the Etihad Towers. 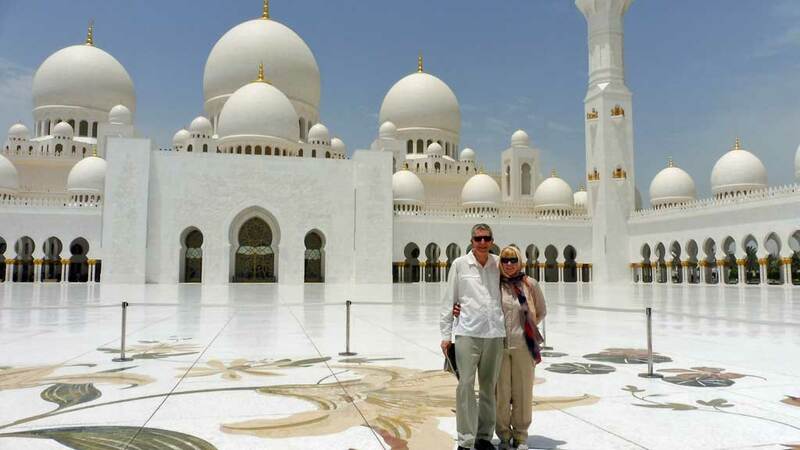 Our last stop was the Abu Dhabi Heritage Village, which paled in comparison to the Grand Mosque. We thoroughly enjoyed our time in Dubai. Emirates isn’t really a Middle Eastern experience though. We got that experience on the second leg of our journey when we headed to Jordan.